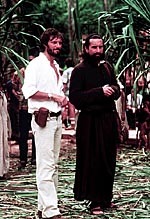 Director Roland Joffé and Robert De Niro as Rodrigo Mendoza on the set of Warner Bros. Pictures' Academy Award-winning epic The Mission. 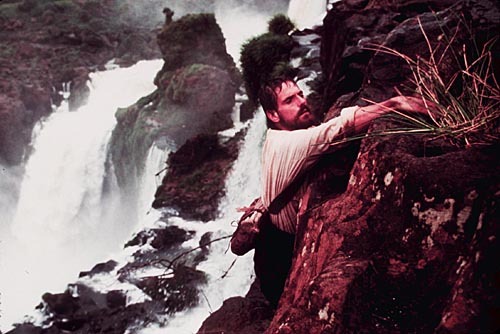 Gabriel (Jeremy Irons) fights for his life in The Mission. 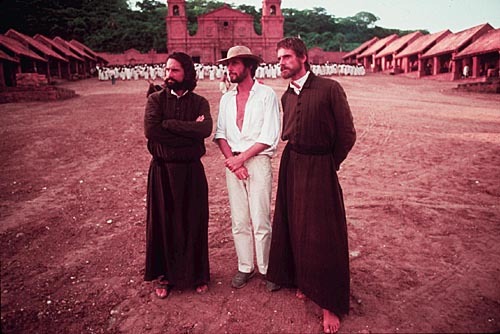 Left to Right: Robert De Niro as Rodrigo Mendoza, Director Roland Joffé and Jeremy Irons as Gabriel on the set of The Mission. 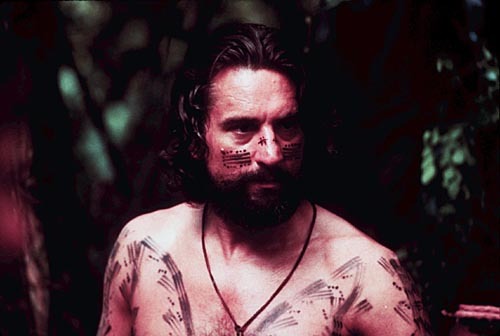 Gabriel (Jeremy Irons) leads a group of frightened natives in The Mission. 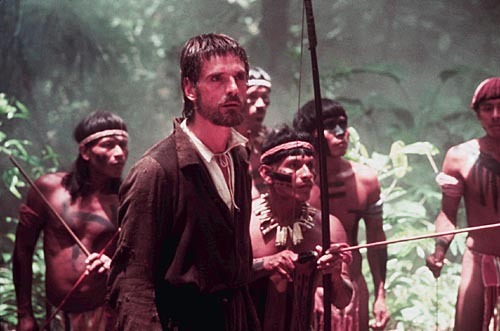 Rodrigo Mendoza (Robert De Niro), Fielding (Liam Neeson), Sebastian (Daniel Berrigan), Gabriel (Jeremy Irons), and Rolf Gray as young Jesuit converse with the natives in The Mission. Robert De Neiro in The Mission. Roland Joffe got an early start at London’s National Theater and was actually the youngest director to ever work with the group. A veteran of British theater and television, Joffe got his start working on television shows, as well as documentaries. Joffe’s big screen debut was quite an amazing one, as his rookie film was the critically acclaimed The Killing Fields in 1984. Based on the real life experiences of New York Times reporter Sidney Schanberg (who was covering the civil war in Cambodia) and his Cambodian assistant, Dith Pran, the film focused on the rise and fall of Phnom Penh to the Khmer Rouge in 1975. The film was nominated for seven Academy Awards (Picture, Director, Actor, Supporting Actor, Cinematography, Editing, and Screenplay) and would go on to win three (Supporting Actor, Cinematography, and Editing). Move forward to 1986 and Joffe’s sophomore effort - and the reason for this interview - The Mission. This visually spectacular film deals with a Spanish Jesuit priest in a Brazilian mission during the late 18th century working to convert the Indians of the region over to Christianity. 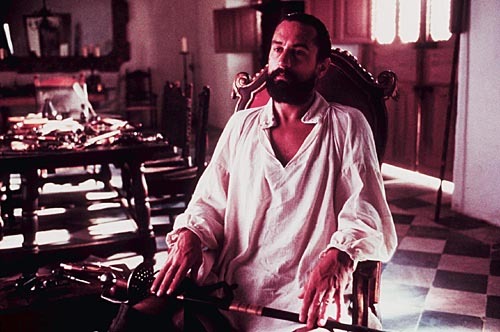 The film won the 1986 Palme d’Or award for Outstanding Film at the Cannes Film Festival and once again, received multiple Academy Award nods (Picture, Director, Cinematography, Score, Editing, Costume Design, Set Design). 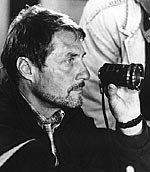 However, this time around, the Academy chose only to award the film with a best cinematography Oscar for Chris Menges (who also won for The Killing Fields) and decided upon Oliver Stone’s Platoon for the Best Picture, as well as Best Director awards. Critical acclaim began to waver on Joffe’s next projects (which I cover with Joffe in the interview), with Fat Man and Little Boy (1989), a film that dealt with Robert Oppenheimer’s work in New Mexico on what would ultimately become the Manhattan Project (for those of you unfamiliar with the project, this was the venture responsible for the development of the world’s first nuclear bomb) and City of Joy (1992), a film featuring Patrick Swayze as an American doctor working among the poor of India. Other projects for the director include the upcoming film, The Invaders, as well as Vatel (2000), Goodbye Lover (1999), and the much maligned Scarlet Letter, starring Demi Moore in 1995. Warner Home Video has announced plans for a new Special Edition of the Roland Joffe masterpiece, The Mission, for May of this year and in order to promote the new disc, I was able to spend a few minutes on the phone with Roland earlier this week and discuss his storied career, as well as what it was like revisiting his classic for Warner’s new two-disc DVD. JOFFE: Hello David! What can I do for you today? DVDMG: Well, it sounds like you’ve got a really busy day today. I’ll try not to take up too much of your time and get your schedule back on track, but I’d like to take a few minutes to talk to you about The Mission DVD that’s coming out in just a few weeks. JOFFE: Sure, I’d like that too. Go ahead. DVDMG: First off, I’m curious how you got your start and what facilitated your move from television and documentary-type films to the big screen. JOFFE: That’s a very good question. You know, I think the way it happens is like this … you know, very good coaches for ski jumpers stand at the top of the slope and actually watch the jumpers prepare rather than standing at the bottom and watching them land, which anyone can do. David Puttnam, who at the time, was a very, very good producer … in some sense, stood at the top of my slope. Well, I didn’t see David for over a year and around that time I was setting up another project and I met him at BAFTA or some other awards ceremony (BAFTA: British Academy of Film and Television Arts Awards – David). He said to me, “What are you doing next year?” I said to him, “Actually, I’m going to be doing a film in Africa.” And he said, “Well, I don’t think you’ll be in Africa.” And I said, “Well, I think I will.” And he told me to come see him in the morning. Well, by this time, my heart had totally stopped and I said, “But David, I’ve never directed a movie … a feature.” He said, “I didn’t ask you whether you had, I asked if you wanted to.” Of course I accepted and David said, “Don’t worry about it. You’ll take to it like a fish out of water. Your television work is busting out of the screen and it simply needs to be on a bigger screen than the TV.” And that’s how it happened … and I owe that man a lot. DVDMG: That’s an incredible story and how you came in to directing The Killing Fields changes my next question somewhat. Even so, I’ll ask it anyway because I wanted to know what influences you to tackle such … well, political … or heavy-handed subjects? I know those aren’t really good adjectives, but they’re all that I can really think of right now. Regardless, what drives you to keep taking on such serious subject matter and projects? JOFFE: Well, it’s kid of weird really because I’m not a very serious person. You know how they say that clowns are very funny in public and are really sad at home? [Laughing] Well, I’m really kind of stupid at home and I guess, more serious in public. I don’t know really – the themes just sort of come. I think that when you look at our world, the truth is that we’re all – all our lives actually - under the influence of politics. Even if we think we’re totally free, we’re not because so many decisions are being made around us and over us and it’s only usually after we’re dead that people can look back and say, “Well of course they did that because look what was happening over here – look how they were pushed in that direction.” And I think that particularly in a democracy, those are the types of things people need to know about and need to be made aware of. Even if we don’t know it or aren’t aware of it, politics and philosophy are really what make our up lives. DVDMG: [Laughing] No! That’s a great answer! A lot of your films – more so after The Mission - seemed to have received a mixed bag of reviews from critics. Then it seems that after everyone’s had a chance to kind of sit back and chew on it a little bit, they seem to change their tune on their initial impressions about the film and you come out back on top. Do you see that as some sort of vindication or do you even look at it that way? Do you simply make films that appeal to you and your target audience? You know, I was in India at a Science Conference where I was invited to speak to a group of Indian astrophysicists and they’re building their own rockets and putting their own satellites up … and one of the things they wanted to discuss was Fat Man and Little Boy. All the Indian press said the same thing … they mentioned that when the film initially came out, everyone attacked it and now they’re reading where people are writing about it and saying how it was prophetic and extremely profound … and it’s really nice when things like that happen. Honestly, I think that the job of movie reviewing can be really tough. When you think that movie reviewers have to review ‘X’ number of films in a day, ‘X’ number of films in a week … and sometimes, if a film has layers that need to be thought about, it’s easy to get missed the first time around. It’s hard to blame someone for that because they simply don’t have time. I’m not anti-reviewer or anything – they do the best they can – and they try to be very honest I think. But I also have the feeling that if the movie’s well made and it’s about things that count, in the end what will happen is that people will ultimately see the depth in it. The Scarlet Letter is a great example. For instance, in The Scarlet Letter, I was totally attacked for changing the end of the book – which I hadn’t – because the end of the book remained exactly the same. You know, it’s not like I went to the library and rewrote it. [Laughing] Then, I was attacked for putting Indians in the film and I’d say, “Wait a minute. If you look at the time, there were more Indians in America – Native Americans – than there were Colonists. So, it seems to me that the problem is Hawthorne’s, not mine. If you want to criticize it, you should criticize Nathaniel Hawthorne for not putting Indians in there.” So then, a statement like that comes out and shocks people and that’s what they decide to write about. DVDMG: Well, I guess it’s better than three of four years later people coming back and saying they really didn’t like it. [Laughing] At least they are going back and looking at it and admitting their initial impressions were incorrect. JOFFE: Absolutely. That’s why I don’t really say much about reviewers. I think it’s a very tough job to get all of the depth of a movie all at once. DVDMG: Well, how did you come about helming The Mission? JOFFE: Well, that came about because after making The Killing Fields, Robert Bolt, who is a wonderful screenwriter, met with me and told me about a project that had been on ice for a long, long time. He asked me if I’d be interested in reading it – it was kind of like a stage play actually – and it was just the story of Mendoza and Waraní Indians. I was so fascinated by it – and I knew so little about Latin America – that I decided to take a trip to Latin America to see if I could find the Guarani, who were the original tribe. Of course, there’s absolutely nothing left of them – there’s just a small population if indigent people with nowhere to live and it’s really, really, sad. They were once a very proud nation really and that touched me emotionally so much that I decided I wanted their story to be told. It was like meeting someone in the street and they tell you something about them and you think that they have a story and life experience that people should know about. So then I started working with Robert (Bolt). Robert had just had a stroke and he was such a brave man. I mean, he struggled with his language and everything and he sort of fought his way back in front of my eyes. So he knew everything about the story and I’d sort of look into his face … and his eyes … and they’d be full of understanding. Although the words couldn’t quite come out, he’d write them down with sort of a shaky hand. I just got more and more involved and I fell in love with the project. I simply felt that it was a great story with some sort of eternal value. DVDMG: When you were making the film, was it a conscious effort to keep it from becoming an evangelical or were you so determined on telling the story of the tribe that the whole missionary story stayed completely secondary? JOFFE: Well, it did in a way become secondary … and that’s a really good question. You know, I wanted it to be a film about being evangelical and what that might mean … good or bad … and that wasn’t for me to comment on. I simply wanted to state that during this little slice of history, this is what happened and these were the good sides of it, these were the more dangerous sides of it, and this was the result. At the end … this is true … the Guarani wanted to keep their musical instruments. And I just felt that there was something so beautiful about what human beings can share and that just became the root of the story for me … that these kids, who after the whole thing, pick up what they need and what they want. And it’s funny, look at the situation we’re in now with Iraq. What are the Iraqi’s going to pick up? What are they going to make out of this whole thing? In a sense, wiser heads do say that the Iraqi’s will have to pick up what they want and the question remains, “What is it going to be?” That type of question goes right to the heart of what it means to be a human being. Do you know what I’m saying? What do we cherish? What do we care for? What do we want our lives to mean? Every life does have a meaning – and I really do believe that – and I think that’s why I try to address my audiences intelligently. The man in the street counts, but sometimes he forgets that he counts. You know, people in the top floor of the apartment looking down at the man in the street forget to tell him he counts too. DVDMG: So true … So when you were making the film, how did you score all the talent? I mean, you look at the roster now and it’s almost like an all-star list of people you’d want to be in a film if you could pick and choose. JOFFE: Yeah, it’s funny isn’t it? There was Liam Neeson, who was just beginning his career … and DeNiro … and you know, I just got people to read the screenplay. DeNiro read it and loved it and really wanted to do it. We both thought it’d be a great stretch for him; a different kind of part. DVDMG: Yeah. You know, I just read where DeNiro is going to play another missionary in an upcoming film and I’m sorry, I can’t recall the name of the film right now. DVDMG: And you were able to get such a subdued performance out of him. Was that a challenge at all or is he just such a consummate professional that it just came? JOFFE: I think good directing is about getting the performance to be just what’s right for the movie. I mean, the actor is concerned with his own bit of it, but the director’s somehow trying to work the whole thing into a much bigger picture. It’s like conducting an orchestra – you have to make sure the instruments are played as perfectly as they can be, but they have to fit in with the orchestra. DVDMG: Just a couple of other questions and we’ll wrap this up. I know you have a lot of other commitments today. How did the Special Edition for The Mission come to be? Did you approach Warner and let them know you’d really like to revisit the film? Did Warner approach you? JOFFE: Actually, Warner approached me and told me they were ready to do a DVD for this now and they wanted to know if I’d be interested in helping. I told them I absolutely would be since I like DVDs so much – it’s such a better format than VHS. They came to me and stated that they wanted to restore the print and I was really excited about that – and they took that aspect of it very seriously and they did it very well. They showed it to me, they showed it to Chris Menges … and then I did a director’s commentary for it that took me completely by surprise. You know, what basically happens is that you go into a room, the movie is played in front of you, and you speak as you see the images. The whole thing just came back to me David – the whole experience and what it was like - and I think that will be a lot of fun for audiences to get the same stream of consciousness that was going through my head at the time. It was very exciting to suddenly recall what I was feeling at the time. DVDMG: What was it like revisiting the film after all this time? I know you’ve worked on other things and have moved on to other projects and although I’m sure you haven’t forgotten about the film, what was it like totally involving and immersing yourself back into The Mission again for the purposes of this DVD? JOFFE: It was like a time trip. I was amazed David at how much I was completely taken back when the first chord of that music started and when that first image popped up. I could recall what it was like writing it, what it was like working with Robert, and on to how extraordinary it was being in Latin America, which is an amazing place to be in. I could remember what it was like building relationships and living with the tribe for a certain amount of time and convincing them to be in the film … I mean everything came back to me and it was just an amazing experience. It really was like a time trip. DVDMG: Well that’s great. I know our readers will really enjoy hearing about that, as well as all the other things we talked about today. The DVD really looks great. Warner has done a really nice job on the disc and the collaborative efforts on the commentary and other features were really nice. The film only gets better with time and hopefully that fact, along with the Special Edition DVD, will translate into these things moving off store shelves quickly. JOFFE: Thanks David, I really appreciate it. DVDMG: My pleasure. Thank you. Roland Joffe was an absolute joy to talk to and I really enjoyed the short amount of time we spent together during the interview. He was warm and personable and his love and dedication to his craft come through resolutely in his voice and demeanor. Warner’s new two-disc Special Edition streets on May 13th and DVDMG will have a review up a couple of weeks before the street date for the set. (Because of the two-week street/review window for Warner releases, we cannot have the review up any earlier.) However, having had a sneak peek, I can say without reservation that this is what fans of The Mission have been waiting for. It’s an incredible set that preserves and honors Joffe’s vision tremendously. Make sure to check it out. Thanks go out to Karen Penhale and Tara Conrad of Carl Samrock Public Relations, Warner Home Video, and of course, Roland Joffe.